Prairie Artsters.com: Erin Schwab “Rooted In” April 5 - May 12, 2007. Front Room, Harcourt House. Erin Schwab “Rooted In” April 5 - May 12, 2007. Front Room, Harcourt House. Without any assumptions, presumptions, or field notes, but on first impressions alone, the image looks most like a hand, wrist exposed, reaching down, clutching and holding on to--or maybe being held onto? Neither hand nor tentacles appears to be letting go; each will desist if the other let goes. In shadow and shade, the image doesn’t seem to be rooted in any one place, from any one time. It simply exists. 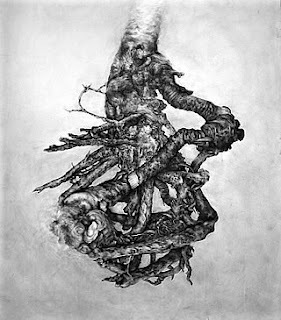 The image, in context with Schwab’s exhibition, is a tree root. There are more charcoal drawings of roots. Porcelain sculptures of roots, some purposefully crumbled and shattered beneath its wall positions, line two of exhibition walls. In context, the image loses its ability to stir the imagination. The image is once again rooted in a meaning, lined up in a defined exhibition that does not know how to present itself as its own entity. There is a tree root. There is a connection between roots and drawings. Finitio.